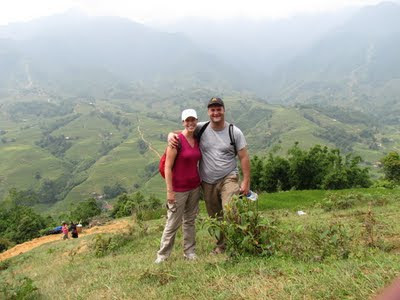 The Inconsistent Nomad: Sapa Part 1: Oh my Buddha! 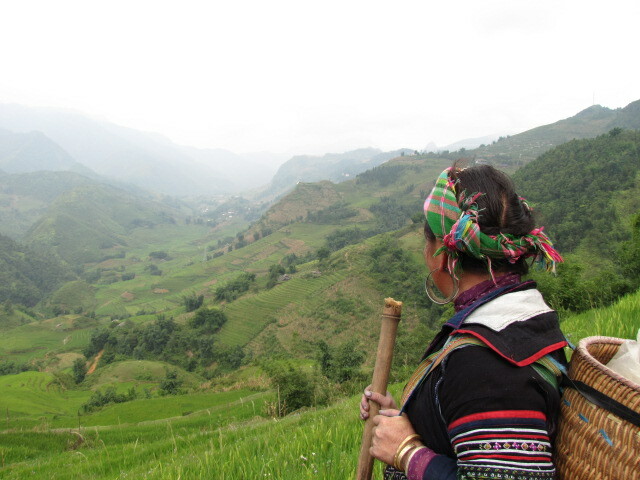 There are about 54 ethnic minority hill tribe groups in the mountains of northern Vietnam. The area they live in is beautiful but makes for a very harsh life. The mountains here are glorious - sweeping mountain peaks, entire mountainsides terraced out for rice paddies, small villiages, waterfalls freakin' everywhere, corn fields, and grazing buffalo. If you come to Sapa and say, "Meh", then you are not human. Turn in your Homo Sapien card and go back to Mars. The two tribes that we encountered the most were Black H'mong and Red Dzao. Each tribe has it's own traditional clothing, and it was beautifully refreshing to realize that the hill tribes do indeed wear their traditional clothing on a daily basis and not just for tourists (lederhosen, anyone?). Most of the clothes sport very detailed and colorful embroidery work that the women do by hand. 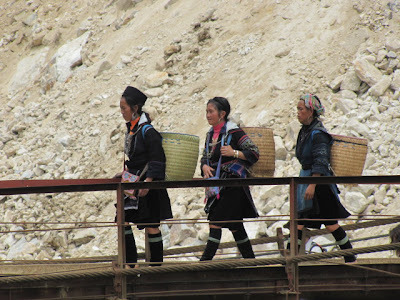 The Black H'mong also wear clothing made from hemp and dyed with indigo. And then there are their shoes. All the women that we saw were wearing sandals. I'm not talking about Keens or Chacos or anything tough and rugged. I'm talking cheap, plastic slip-on shower shoes that you can probably get for $10 at Wal-Mart. These women walk every day up and down the mountains on narrow, technical, rocky, muddy trails in dadgum shower shoes. Did I mention that most of them haul large baskets of hand-crafted goods or food on their backs? Or have babies strapped to their backsides? Yeah. Showoffs. ﻿Dan and I were both pretty humbled by these women trotting up and down steep mountains in plastic flip-flops with babies and corn and such on their backs. Next up: stories from the trail and our homestay with one of the hill tribe families!